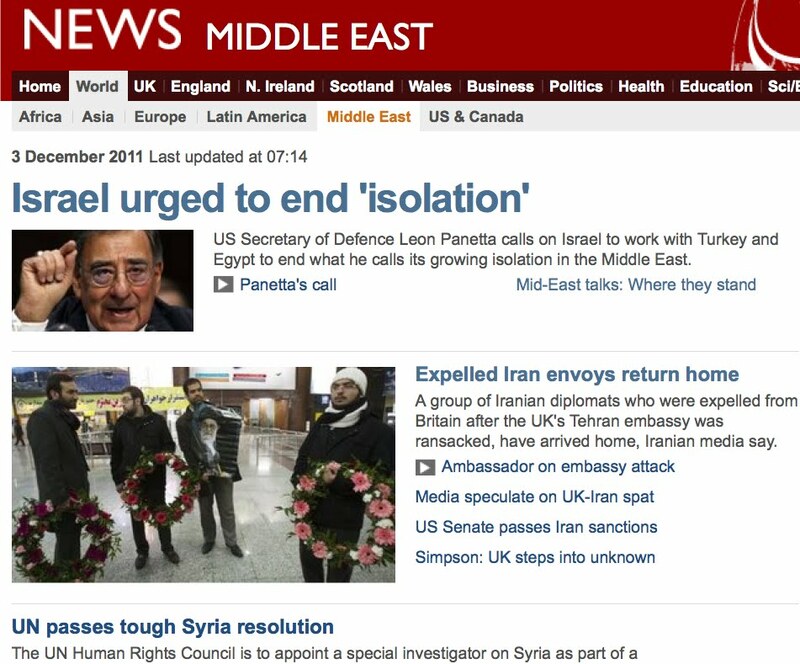 Apparently US defence secretary Leon Panetta made another speech about Israel’s isolation. “Just get to the damn table” he urges Israel in his vernacularly vocal style. Just the other day, in October to be precise, he said more or less the same thing: “The most important thing they can do is go to the negotiating table. You are not going to achieve Middle East peace by trying to slam-dunk it at the UN,” he said. 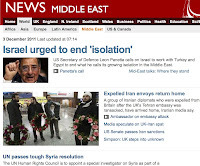 Okay we’ve already gathered he thinks Israel should make suicidal concessions. Surely he’s heard that the Palestinians tore up the rules when they ran off to the UN with their bid for statehood? If not, he must at least have heard that Turkey, Egypt, Tunisia, Yemen, Syria, Uncle Tom Cobley and all are being increasingly belligerent, and have stepped up the default blame-shifting for all their own internal failings, onto Israel. Panetta must realise, surely, that a useful scapegoat will not be sacrificed lightly. The Arab World will cling on to these tactics as long as people are gullible enough to fall for them. Taking their conspiracy theories and bizarre distorted accusations against Israel at face-value, as Panetta obviously does, doesn’t show much political intelligence or judgement. Giving his views undue prominence by making his speech top story for several hours on their website with nary a squeak of criticism in sight is bound to look as though the BBC concurs and expects us to too. Leon Panetta thinks appeasing the Arab World will keep the West safe, and his repetitious outbursts make sure we know it. Repeating the same thing over and over may be one way of making your wishful thinking appear credible, but it still doesn’t make it true. In the context of a plethora of more significant Middle East/World news stories, the BBC concentrates on that, ‘same old story’ speech, but deliberately turns a blind eye to what is slowly but surely dawning on others. The Arab Spring is turning into an enormous Islamist calamity, for Israel and the West, while the BBC fiddles with Jeremy Clarkson.